Lots of craft breweries open up, but few of them do so with a scenic lake location and an adventurous artist at the helm. But Lakeland Brewing Company has both. The location is on gorgeous Lake Mirror in Lakeland, FL, and the owner is artist and event planner Francis Janes, along with his sister and brother-in-law. Janes’ creative background brings palpable purpose to the look and feel of every aspect of the brewery, and the details add up to an identity that is original and refreshing. One sign of his push for purposeful design: he painted the inside of the brewery and tasting room himself. Another: he carefully chose the bright colors and varying tiles, textures and recycled products for the tasting room and also put a ton of thought into the layout and setup. The location is pretty fantastic. As Janes points out, most breweries are in industrial parts of town where there’s little foot traffic, and they rely heavily on social media and word-of-mouth. While word-of-mouth is never a bad thing, neither is having a top-notch lakefront location. And Lakeland Brewing Company plans to honor the old skate park by naming the brewery’s tap room Old School Annex. The brewery itself will offer tours of the beer-making process, and the tap room will serve food and beer and educate the public on LBC’s offerings. Another sign of Jane and his partners’ attention to detail: The two parts are actually separate entities under a parent company, which gives them the option to open more Old School Annexes if the opportunity arises. “We’ve set ourselves up for that, which is the same way a movie would leave itself open-ended for a sequel,” he said. Now that’s a smart strategy—even if those kinds of movies sometimes bug us. Janes is an artist by nature, with a degree in visual art and an MFA in Painting and Drawing. A well-designed space sets the right mood and tone and keeps people grounded and comfortable, he said. The Old School Annex, in particular, captures Janes’ artistic leanings. He went with an eclectic mix of bright colors, tiles, wood, wainscoting and a pressed tin ceiling. He recycled and repurposed all the materials he could, turning rafters into tabletops and reusing the steel beams that covered the loading dock. He was also careful about the shape of the room, so that people don’t feel lost in a huge space. “I think all of those little tiny details add up and I…want the space to feel rich but humble,” he said. One of Janes’ favorite parts is naming the beers. A lot of the names speak to interesting historical facts about Lakeland, and others are fun, inventive ones that relate to other things. The brewery’s first four releases are Portico, an East coast porch ale; Pah'le Ah'le, a West coast style ale; 80 Acres Abraham IPA, which honors Lakleand founder Abraham Munn; and a red rye called Damn it, Janet! for Janes’ sister. LBC also offers Acer Nook Florida Wheat, which alludes to the 1940-50s hotel of the same name; and One Eyed Revenge, which references a one-eyed alligator that famously lived in Lake Mirror in the 70s. Right now the beers are being kegged and distributed, with the eventual goal to start canning them too. Janes already has a designer in mind for the labels, and he’s kept an eye on the different shapes, sizes and designs of modern day beer cans. There are also plans for new beers and seasonal options in the future. “I like naming beers. I look forward to making more styles,” Janes said. Janes came up with the logo himself. Well, sort of. “I designed it, but I didn’t do the work because I’m an old school pencil and pen kinda guy,” he joked. He sketched several ideas specific to the brewery’s location, which he hashed out with his designer. Janes knew he wanted a swan in the logo, but he didn’t want it to be the focus. He had one other request of the swan: it had to look a little mean. Swans are gorgeous, he said, but they’re actually pretty mean birds. This attention to detail pays off. 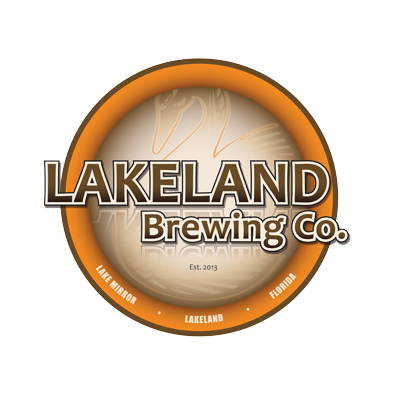 The overall effect of the logo is a good blend of modern and vintage, which speaks to the history of Lakeland while also capturing the very much present-day micro-brew craze. It also has a very clear and specific point of view. The Logo-type is graphic and stands out on its own, and LBC uses it for the tap handles. It looks great, and still has a strong thread to the full logo. As for Lakeland Brewing Company’s ideal client? That’s pretty simple. “People who are just easy going and are looking to kick back and have a good time and enjoy their time here,” he said. Doesn’t matter what social stature and economic status, he says; he wants the brewery to be very inclusive and community-oriented, where anyone can feel welcome. LBC will soon have a website, as well. Through the site and social media, LBC will keep customers updated about special events, new releases and seasonal options. So, what’s The Fred Group’s verdict? With intentional choices, the Lakeland Brewing Company has put together a series of interesting and well-crafted details, which build into a bigger picture that’s sure to be a hit in Lakeland—and beyond.